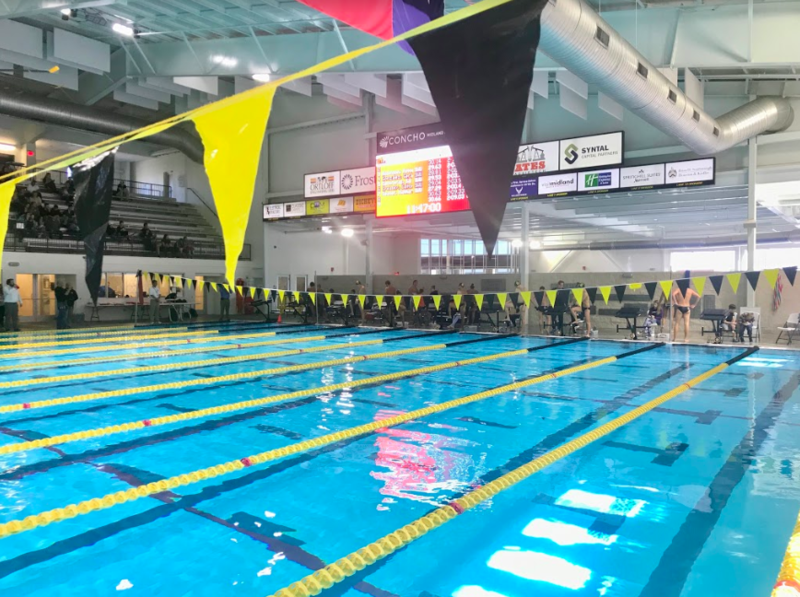 On January 26th, the Southwestern Pirates took on the Division 2 UTPB Falcons at a dual meet in Odessa, Texas. The Pirates headed out to Northwest Texas on a five-hour car ride to reach their meet destination. This dual meet was UTPB’s Senior meet recognizing the stellar senior swimmers of their own team. The meet commenced at UTPB’s relatively new swimming facility that had two pools each with ten 25 yard lanes. The meet began with the 200 Yard Medley Relay. Southwestern women’s A relay took first place with a time of 1:51.41. On the men’s side, Southwestern’s A relay took second place with a time of 1:37.44. After the relays, the women and men’s 1000 Yard Freestyle events took place. On the men’s side, Matthew Oevermann took first place with a time of 10:09.93. In the women’s 200 Yard Freestyle, Southwestern swept second through fourth place with Jesse Stovall in second place with a time of 1:59.73. On the men’s side, Dylan Neumann took second place with a time of 1:47.22. In the women’s 50 Yard Freestyle, Cara Chin and Erika Dubros both took second place with the same time of 25.85! On the men’s side, Todd Coachman took third place with a time of 22.80. In the women’s 200 Yard Individual Medley, Ashley Harmon took third place with a time of 2:18.60. On the men’s side, Connor Moland and Alek Argueta took first and third places with times of 2:00.41 and 2:03.59 respectively. In the women’s 1 Meter Diving, Kyla Gorman took first place with a combined score of 167.93 and she also took first place in the women’s 3 Meter diving with a combined score of 166.73. In the men’ 1 Meter diving, Matthew Credeur took second place with a combined score of 106.58. In the women’s 100 Yard Fly, Erika Dubros and Brynn Stokes took first and third places with times of 1:03.04 and 1:04.82 respectively. On the men’s side, Keith Gill and Dylan Neumann took first and second places with times of 52.89 and 54.19 respectively. In the women’s 100 Yard Freestyle, Jesse Stovall took first place with a time of 54.07, and on the men’s side, Mario Foltz took second place with a time of 49.20. In the women’s 100 Yard Backstroke, Ashley Harmon took first place with a time of 1:01.96. In the women’s 500 Yard Freestyle, Natalie Gierat and Megan Mick took second and third place with times of 5:36.13 and 5:54.04 respectively. On the men’s side, Peter Robinson took first place with a time of 4:52.80. In the women’s 100 Yard Breaststroke, Jennifer Turlington took third place with a time of 1:19.32. On the men’s side, Alek Argueta took third place with a time of 1:01.63. In the women’s 800 Freestyle relay, Southwestern’s A relay took first place with a time of 8:23.75. On the men’s side, Southwestern’s A relay took second place with a time of 7:16.70. Overall, the Pirates fought off the Falcons up until the last race. The Pirates kept up to the Falcons and it was a close race throughout the meet pointwise. The Pirates took home four first place finishes, six second place finishes, and three third place finishes. Although the Pirates gave it their all they fell to the Falcons by 21.5 points.